What Factors Are Considered When Determining a Credit Score? | The Consumer Law Group, P.C. In order to have good credit, you have to have some kind of credit history. In other words, in order to borrow money, you have to be able to show that you have borrowed money responsibly in the past. This may seem a little counterintuitive as it means that those who have never had to borrow money may have a difficult time when they are applying for a mortgage or car loan. However, it’s important to understand what kind of credit habits lenders want to see so that you can establish the right kind of history. Payment history. A history of late payments and unpaid bills raise a major red flag for lenders, so this is the factor they place the most weight on. Late payments will remain on your credit report for seven years. Age and type of credit. How long have you had credit? Do you have a variety of credit types? A mixture of loans and credit cards maintained over a long period time looks very good to lenders. Use of credit. How dependent are you on credit? Keeping your balances below 30 percent of your available credit will have the most positive impact on your credit rating. Total balance. Whether current or delinquent, the lower the total balance of debt you owe at any given moment, the better it is for your rating. Recent behavior. If you have recently opened a number of credit cards and had many inquiries from other potential lenders, this may impact your rating, but not as much as the factors listed above. Available credit. As it is fairly easy for most people to be approved for credit cards, the amount of credit you have available to you is not a strong factor in determining your score. In other words, lenders are not impressed by someone having a lot of credit cards with high limits. Again, FICO may use slightly different criteria and places weight on factors differently, which explains why the two scores will not be the same, but, in general, these factors are important in establishing a good credit rating. 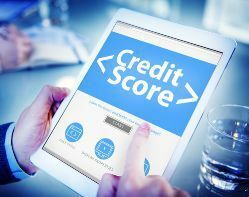 If your scores are not what you think they should be, or one score is far below the others, you may have errors on one or more of your credit reports. We can help you sort it out.